YES! We're animal friendly. As long as your pet is not a nuisance to others sharing our camping facilities, your pet is most welcome at the Kokerboom Motel. Suites are equipped with BBQ facilites. Pre arrange BBQ packs with management. Enjoy the ambience of the elegant ladies bar where you can enjoy a relaxing drink or bar lunch with friends. 60 x Oversized caravan sites with electrical power supply and water, prisine ablution facilities, laundry (washing machine & tumble dryer), diningroom, ladies bar, pool room and TV Lounge area. Seasonal hunters who overnight with us are most welcome to use the specially designated coldroom facilities for their carcasses. 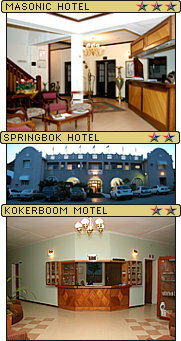 The Kokerboom Motel has outstanding fully airconditioned conference facilities. Full catering and accommodation can be included in conference packages. Contact us to book your conference now. Need a gift? The Kokerboom Motel has several display cabinets with beautiful handcrafted curios on sale. Dinner is served A La Carte in the spacious diningroom from 19H00 - 22H00 hours. Special menus have been introduced to accommodate "little people", the menu is known as "BOOMPIEKOS", unique to The Kokerboom Motel and a product of Magdaleens imagination to get the kids interested in their food! The Kokerboom Motel caters for weddings, birthdays, product launches or any special occasion. Please contact us for further information. There are several walks and hiking trails in the immediate area. Speak with Pieta who will guide you on this.